I have been busy the past couple of days working on my home network. I had a DNS resolution issue with my server. So I had to rebuild the system and flash the firmware, upgrade the BIOS, drivers etc. Finished up last night, activated the active directory, configured the DNS, WINS etc. Yes, I have an AD domain in my house. 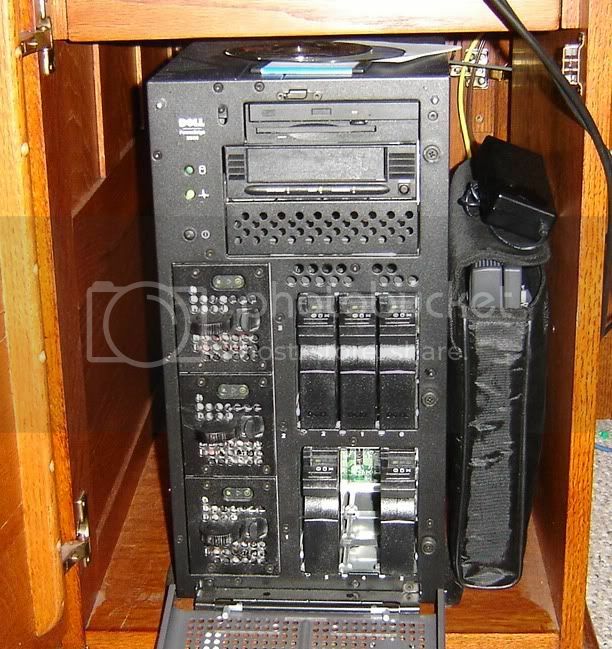 That is a Dell PowerEdge 2500, 2gb RAM, a RAID 5 controller, hotswap ultra-320 10K SCSI drives, twin gigabit NIC’s, redundant power supplies and a DLT tape drive. Ya, it is overkill, and two feet long and 80 pounds, but it is all mine.